How much normally in other places? Worth punt at this price?? Not the cheapest lifetime price on this looking at previous deals, although seems like a good dip from the average all things considered. Yep these have the aluminium pump unlike the yellow models that have plastic ones and crack when they freeze in winter. Brilliant machines. Far better than those yellow plastic ones. Photo is quite misleading, as that is of a K3 home, which has extra kit, which this does not have. Been looking for one of these for a while, seems a good price with all the accessories. It looks like they probably only had 1 in stock. I just got refunded. And you can't add it to the basket. So it's sold out as the message says. There are still 6 left. I didn’t buy because could not justify spending £60 on this when Lidl Park side Pressure Washer is also for £60 in their weekly deals. Bought this at £59 without the patio cleaner in January. Took it out of box today for first time and was doing a great job until a hole blew in the main nikfisk hose! Fair play to amazon, one phone call and a replacement on way. Don’t think it’s a general issue as I have tried to google it. I got this same set from Amazon for 54.99,although it's been about 9 months. It does hover around 54.99-59.99 on amazon quite regularly! This is not a good price. Definitely have to agree with the rest. Patio cleaner is not good at all. If you can pick this up without the patio cleaner for less, it's worth the saving. It has a bar inside that spins, creating a 'swirl' action. It looked good when I did my york stones...until they dried! and I was left with a light swirl pattern of dirt across all of them, so had to do them all again without the attachment. Nilfisk are a great make. I have had the C130 for over 5 years, and never had any problems. Advise you drain it thoroughly, or keep it inside during winter. If the water inside it freezes, it can expand and split the cylinder. The K2 model is only worth this price when new. Expired now, there was an extra discount before. The sale prices come and go quite regular so worth to checking back for anyone interested. if your lucky thats not guaranteed, what ones been sent back and the pumps failed or plastics are scuffed up? sometimes things get abused anyway i leave it there im not going to keep going in circles, people can make the own minds up. 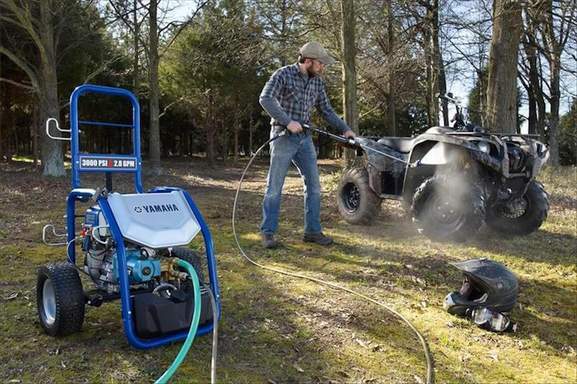 Never miss a 'Pressure Washer' deal again! I bought this from Lidl back in February for £49.99 complete with hose storage. Looks like the foam gun that comes with it has adjustable spray pattern and flow anyway. If not, the fittings look like Lavor to me, or maybe Bosch. Is that 70bar of working pressure? If so only ever good for cleaning dirt off your shoes. Homebase do the same with Qualcast. This has a 3 year guarantee which is pretty good. I know people who have had no end of trouble with Karcher washers and switched to other brands. Just so people are aware Argos buy this brand name and use it to brand products they manufacture themselves. Similar to what companies like Polaroid do with TVs. I’ve just got a lawnmower and strimmer made by S&amp;J - it’s fine but I’d argue not up to the quality of their garden tools. Manual says it’s manufactured by Argos. It is a bit noisy but really powerfull makes the electric ones seem Rubbish. Nice. 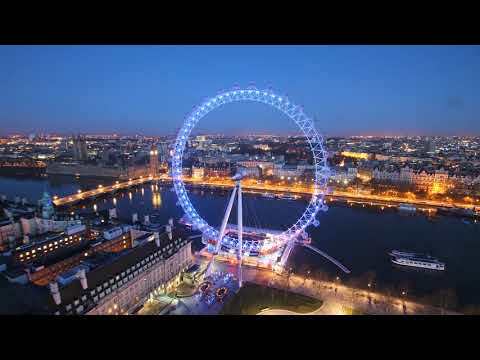 Is it really noisy ? Try the Lidl one i have one,Been brilliant for 2 years. I bought a Nilfisk 110 with Patio cleaner from Amazon Warehouse last week when it was on offer, £44.73. Put it all together and turned it on, water flowed through but motor didn't work so no pressure. Sending it back - super disappointed!! Try and find a pressure washer with a cast metal pump housing and not the plastic type pump housing that the low end Karcher's K2's have. No Nilfisk have great deals either at Amazon or their outlet. Sorry for silly question but which type of pressure washer people in YouTube videos use to make driveways look like new? It's now gone up to over £340 but still available on the other site skdotcom posted. Reduced to £164.99 in Amazon’s Deal of the day. I believe the one in the new tv advert is the ‘Full control plus’ model. I’ve not seen that model anywhere yet, but the difference appears to be push buttons on the lance to adjust the pressure, whereas on this version you have to twist the nozzle to vary the pressure, and then the change shows in the LED display. Depends on what models they were, anything less than this model (So K1/K2) have plastic impellers and pumps and are notoriously prone to the issues you mention. K4 and above are brass pumps etc and much higher quality. Thanks @DavidMoses Is this the one currently in TV ads where the chap reveals his house with the machine? 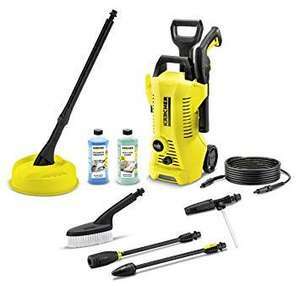 People usually prefer Nilfisk as they have a cast metal pump housings and the Karcher's have a plastic pump housing unless you buy the higher specification Karcher's. I have personally found Nilfisk's more reliable and better built than Karcher's. Not much to choose between this and the nilfisk. People tend to prefer either Nilfisk or Karcher, depending on what they currently have. Both have 2 year warranty. This has a 4m hose, nilfisk is 5m. These are normally about £100 with the Patio adaptor. Just bought one and it is perfectly adequate for home stuff. My question as well. Which is better And if warranty would be different? Worx Hydroshot body only, cheapest it's been in some time. Not quite the £51 it was back in May, but a very good price at the moment. Good price. Definitely get a bigger battery than the 2A one it lasts about 25 mins with continuous use. Is it worth it??? Depends what you want it for, so I have one that i use to clean my road bike with, it's not too powerful that it would damage bearings as there is a H/L button that is for High or Low pressure, the fact its battery operated means i can go anywhere and clean the bike before it goes in the back of my car. Would be excellent if i had a mountain bike, as generally i finish my rides where i start them. As for my car from the main water there's enough power to remove dirt and wet the car prior to washing with a mitt. So for me its ideal but if you want to clean patios/stubborn stains where there's no paint or bearings to damage get a proper pressure washer. If you want a really portable unit to give a quick wash to something and yes as it says you really can use a 500ml bottle of water (it wont last long though) to clean things then its worth it. Agree with TeamMCS Absolutely zero replacement for a pressure washer. It serves a purpose - a good portable water hose when no power or water hose. But its not brilliant. I have one. Bought mine a month ago. The box was tidily taped around the top and all the bits inside were in polythene bags as expected. No signs whatever of previous use. Nothing to worry about I'd say. Just recieved mine does anyone have cellotape around the top of the box feel like my new condition isn't new. Not much in it. 10 bar and a few more litres per min. You wont notice the difference. Its decent, but I wish I'd paid a bit more for something more powerful. As the name suggests, pressure washers are cleaning tools that create a tightly focused jet of water which can then be used to clean off dirt from surfaces. You will usually find them being used in gardens and public spaces where stone or wood needs to be cleaned, but they are also very useful for washing cars and other machinery, speeding up the job and allowing complete precision. 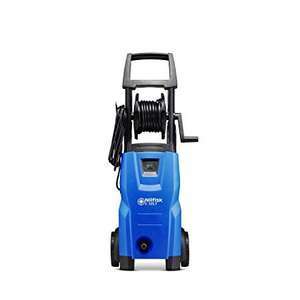 There are many brands and types of pressure washer to choose from. Some of them are adapted for gardens, some can clean glass, while others are ideal for washing cars. 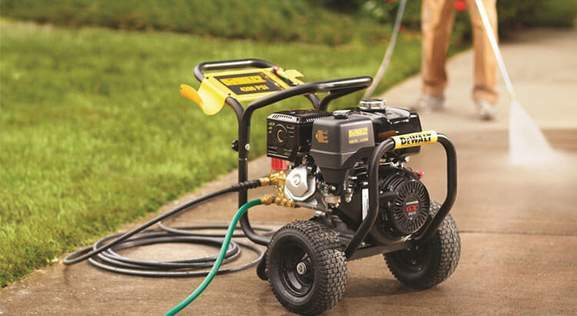 This buyer's guide will help you pick the perfect model and find the cheapest pressure washer deals possible. The world's very first pressure washer dates back to 1950, when German engineer Alfred Karcher designed his pioneering washing device. 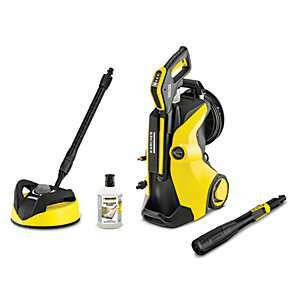 Powered by petrol, Karcher's DS 350 was a real game changer, being small enough to use in home situations and becoming a favourite among professional cleaning companies. 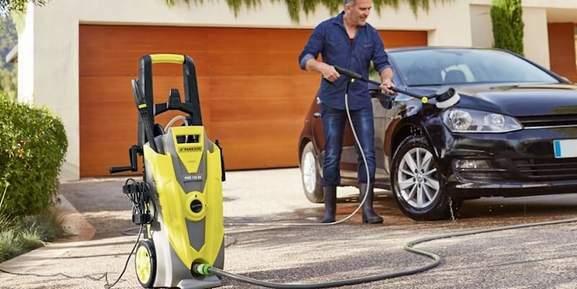 Since then, Karcher have expanded their range and been joined by plenty of competitors, creating a crowded marketplace. At the same time, pressure washers have become standard issue in workplaces and gardens all over the world, with electric devices joining the fray. Nowadays, customers can choose from light and heavy duty washers, with extremely mobile and very powerful options there to select. It's a good time to be faced with a cleaning challenge, with so much technology at your disposal. Pressure washers can be used in a huge range of situations. Most commonly, they are used to clean off dirt, paint, dust and other deposits on exterior stonework. Landscapers often use them to finish off their patios, while they can also be used to restore the original brilliance of marble or limestone. They are also commonly used to remove paintwork, whether that's around the edge of a ship's hull or the graffiti on an urban wall. Sometimes, they are used to clean out chemical tanks (though rarely in a domestic setting), and they can be used carefully to clean windows and other glass surfaces as well. Often, professionals use pressure washers as a way to prepare surfaces for other processes. For instance, they may clean off a wooden surface before applying a sealant, or clean concrete before adding a water-resistant coating. Basically, pressure washers will be the tool of choice when people are handling the most difficult to remove stains and substances. That's why they are such an indispensable tool for home owners and professionals all over the UK. When you get down to it, pressure washers aren't that complex. They consist of a mobile unit which can be connected to the mains water supply or may carry its own water supply. It will also require a source of power, which could be mains electricity or a fossil fuel like petrol or diesel. Most importantly, pressure washers need to include an efficient pump which converts its water supply into a pressurised jet. As the water is pressurised, the pump injects it into a (hopefully) robust hose, which is in turn connected to a nozzle attachment. Various types of attachment are available, but all of them convert a stream of pressurised water into a more diffuse spray. That's basically it. The secret lies in how mobile washers are, how powerful and efficient their engines are, how reliable their components are and how adaptable their attachments are. With so much pressure involved, the quality of the seals and materials is crucial, which is why there's a massive price difference between the cheapest models and devices that professionals rely on. When you start searching on the HotUKDeals pressure washer listings, you'll come across three main types of washer and a few sub-sets. It's worth familiarising yourself with the options available before even thinking about making a purchase. Light duty washers – These models are compact and energy efficient, but distinctly underpowered compared to their bigger brothers. Usually rated at no more than 100 bar (the standard unit for pressure), light duty machines are the cheapest option. They can be ideal for cleaning garden surfaces where soil or dust is the issue, and they are useful for cleaning bikes and cars as well. Because of the relatively small amount of pressure they create, they also tend to be appropriate for cleaning greenhouses and windows, where heavier options can be counterproductive. Medium duty washers – Moving up the pressure washer scale, medium duty machines are usually rated at between 100 and 110 bar. When you turn them on, you'll notice the upgrade in power, which makes them handy for flushing out gutters or drains, and for cleaning larger vehicles. They are the type of cleaner you'll see at most outdoor car washes. Because of the slightly larger amount of power they generate, they are much better suited to cleaning larger spaces than light duty washers. Heavy duty washers – The big daddies of the washer world, these relative behemoths are generally reserved for professionals, but you might find a use for them too. They always come with a hefty price tag, which reflects their size and power, which generally exceeds 110-120 bar. At that level, the force created by heavy duty washers is considerable, so they require a certain amount of strength and practice to use. While they are perfect for cleaning truly stubborn deposits and erasing paintwork, they can be hazardous if you aren't a confident user. Petrol – These models don't require power cables and run off petrol tanks (so they will require you to store some petrol cans somewhere on site for when you need to start cleaning). Only suitable for outdoor use thanks to the fumes they generate, petrol washers tend to be at the larger end of the spectrum and more powerful than electric alternatives, and are favoured by those in the trades for challenging cleaning tasks. Diesel – Identical to petrol models in all aspects except one, diesel cleaners use diesel as their fuel and come with the same safety proviso. Electric – Powered from the mains electricity supply via a cord, electric pressure washers are usually lighter and hence more mobile (if you discount the cord length). These washers are the only type that can be used indoors safely, and are ideal for more delicate cleaning jobs where you absolutely need to factor in the condition of the surface being cleaned. Pressure washers for cars – You may also find specialist pressure washers that are aimed at motorists. It's worth picking up one of these machines if you are only going to use your washer to clean your car or bike's bodywork. They tend to have sprays measuring between 5-8 cm wide, and the right pressure rating to avoid damaging the paintwork, as well as special settings for things like mirrors and headlights. Motor type – Washers tend to come in two motor types: induction and universal. Universal motors work using a brush mechanism and are lighter, making the machine as a whole easier to manipulate. Induction motors use pistons and produce less noise, create more pressure and are generally more efficient. Motor size – A measure which gives you a good indication of the brute force created by your washer's pump, motor size is actually measured in watts, so it's not a capacity value – it's a sign of how efficiently your pump turns electricity into motion. Hose length – How long the hose is on your pressure washer will largely dictate how mobile it is (unless you go for a model with its own water tank). You won't necessarily need a 5 metre hose, if you are just cleaning a patio, but if you need to reach every panel of a car, then the extra length will be welcome. Safety valves – Higher quality pressure washers come with “safety release valves” which cut off the supply when pressure levels become dangerously high. That's a particularly important safety option if you are choosing a high-powered petrol option. Water flow rate – Literally, how quickly your pressure washer will be able to pump water through the hose and nozzle, measured on a per hour basis. Pressure bar – When we're talking about pressure washers, it's not surprising that pressure is all-important. Always measured in bars, and generally stretching from 90 to 130 bar, pressure is displayed as either the “maximum” or “bar-rated” pressure. The maximum pressure is just that – the highest possible amount. It's not necessarily the operating pressure, and is often generated very briefly after the machine is switched on. By contrast the bar-rated pressure is an average, and hence it's much more instructive. Weight – If you are lugging your washer around a garden or workshop, weight matters. Larger models tend to weigh in at between 15 and 20 kg, while light duty washers are much lighter. Remember that it's a trade-off, though. That weight is there for a reason: to create power and stabilise the machine. 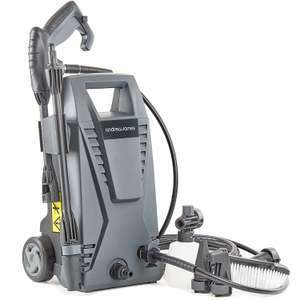 Karcher – the granddaddy of all pressure washer manufacturers, Karcher set the ball rolling in 1950. Nowadays, their product range covers all of the bases, and advanced models like their Full Control range provide an unprecedented degree of accuracy. Lancer – Lancer are different. They specialise in creating pressure washers for using on glass surfaces, offering a range of static pressure washers that are adapted for the catering trade. If you need to clean hundreds of pint glasses or glass trays, they are the company to look for. Hyundai – Manufactured by the Korean giant's Hyundai Power Equipment arm, these devices are affordable and reliable, with petrol and diesel models for pros and pumps created by the Italian specialists Annovi Reverberi. Draper– British company Draper Tools offer a popular selection of washers, from highly compact domestic models to heavy duty options for trade professionals. Vax – “Built to last” in their own words, Vax pressure washers tend to be of the light duty variety and are ideal for everyday garden cleaning. Some also feature special car bundles, with detergents and special lances to make vehicle cleaning much simpler. Nilfisk – Danish tool company Nilfisk also supplies plenty of respected pressure washers, specialising in features like handy wall mountings and “click and clean” which makes it easy to switch between nozzles. Bosch – Tool giants Bosch have also got in on the act, supplying a huge collection of pressure washers, featuring large handles and mobile designs that are some of the most efficient around. What About Pressure Washer Accessories? Lances – These handy attachments extend the range of standard nozzles and add new delivery options, including “snow foam” lances to deliver foaming detergents. Cables – Extension cables can turn a limited electric washer into a cleaning tool that covers every inch of your patio decking. Brushes – Brush attachments can be added to the nozzle, creating a super-efficient way to clean off encrusted dirt. Detergents – Particularly important for cleaning cars until they are dazzling, detergents are often added to pressure washer tanks or nozzles to enhance the cleaning power of their water jets. Some washers come with detergent tanks already installed (so double check before you buy). Others need detergent to attach to the nozzle. Whether you are looking for a way to create a brilliant shine on your car's paintwork, or a solution to a dirty patio, pressure washers could be just what you need. There are plenty of reliable brands and different models on the market, so finding the one you need shouldn't be tough. Before you do start hunting for pressure washer offers, be sure to get a good idea of exactly what you are looking for. Check out the specifications of each model and think about how much power you need. Make sure you look for washers that you can move around easily, and pick the right power source too. At HotUKDeals you'll find listings from major brands like Bosch, Draper and Karcher and from retailers like Argos, Amazon, Halfords and B&Q. To get the best possible deals, think about when to buy too. There may be great pressure washer deals as the summer car washing season nears, and you can wager that deals will multiply as Black Friday approaches in November as well. Sometimes, mops and cloths won't cut it. That's when you need to bring in a pressure washer to get the job done. From car washing to finishing decking designs, pressure washers are crucial in many situations. Pick the type and model you want and head over to the HotUKDeals pressure washer listings, to clean up on cleaning equipment deals.